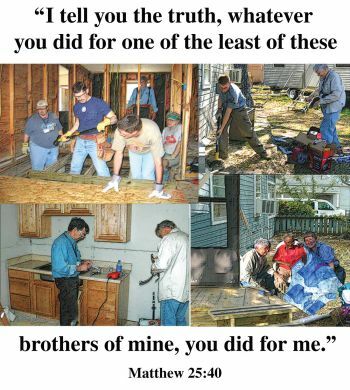 Since 2008 our church has visited Vermont, Kentucky, and Georgia on mission trips, as well as others with disaster relief for natural disasters. The trips to Georgia have been in association with the North American Mission Board and WorldChangers trips. This has been a great experience for the youth, college age, and adults that have participated in these trips. We are partnering with the city of Brunswick near the coast of Georgia in order to be familiar with the area and to have a connection that goes deeper than just one year at a time. On these trips we spend much of our time working on houses in order to meet physical needs so that the people will be more likely to listen to us talk about their spiritual need of a Savior. The other domestic trips have involved putting on a vacation Bible school, sports camps, and work that was needed around local churches. These domestic trips are of an advantage to many because of the cost in comparison with international trips and the time required to invest in a shorter trip.